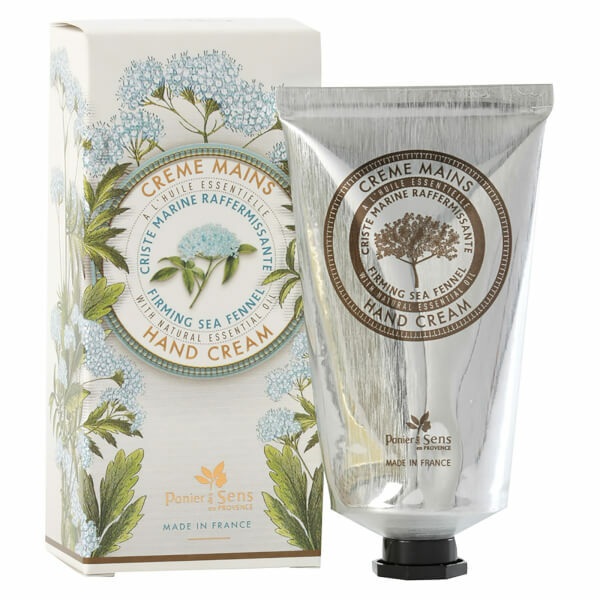 Create younger-looking hands with Panier des Sens The Essentials Firming Sea Fennel Hand Cream, a rich moisturiser with skin-toning properties. Formulated with 20% Shea Butter, the cream absorbs instantly into hands to replenish lasting hydration, erase dryness and create a silky-soft skin texture. Sea Fennel Essential Oil provides mineral sea salts such as Potassium and Vitamin C, which provide plumping, firming and brightening benefits. After use, hands will feel ultra-smooth and appear radiant and youthful. Aqua (Water), Butyrospermum Parkii (Shea) Butter, Glycerin, Propylene Glycol, Cetearyl Alcohol, Olea Europaea (Olive) Fruit Oil, Glyceryl Stearate, Peg-100 Stearate, Ceteareth-33, Talc, Crithmum Maritimum Extract, Parfum (Fragrance), Xanthan Gum, Polyacrylamide, Caprylyl Glycol, Chlorphenesin, C13-14 Isoparaffin, Ethylhexylglycerin, Allantoin, Laureth-7, Tocopheryl Acetate, Citric Acid, Sodium Hydroxide, Tocopherol.